Very nice and great price. I have small wrists so it is a bit large on my wrist but I still really like it. Should have read the measurements before ordering. 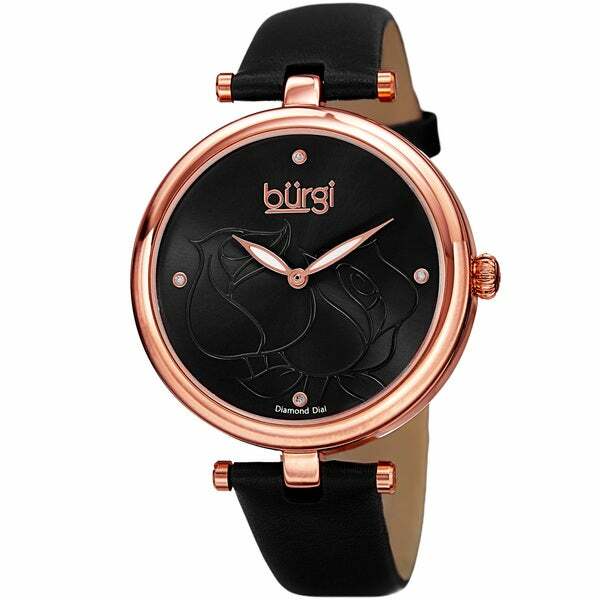 This fanciful women's timepiece features a polished case with a exquisitely rounded bezel. The vivid glossy dial is decorated with an etched floral design, and four genuine diamond markers. This watch is powered by a reliable Japanese quartz movement. I have been very pleased with the watch. It works well. I purchased it because I wanted a nice every day watch, not too much design and black. I purchased this for an excellent price and have gotten lots of compliments on it from friends. I would definitely recommend this watch. Very nice looking watch. Comfortable to wear and I do get compliments from wearing it. Made well and when the metal back is on my sensitive skin, it doesn't make me itch. Love the watch; good price, loved the look, price was really reasonable.